DETROIT (WXYZ) — Exciting changes to Red Dunn Kitchen, inside Trumbull & Porter Hotel in Corktown, bring a redeveloped menu under the direction of newly appointed executive chef, Michael D’Angelo. Since coming on board in February 2019, D’Angelo went straight to work revamping the two-year-old restaurant’s concept and menu, transforming it to one that is poultry and game-focused with main courses featuring elk, venison, wild boar, quail and partridge. Other main courses include Quail a la Chasseur, roasted, bacon-fig stuffed with pickled radish and sauce Chasseur; the generous cut coffee-rubbed Elk Chop served with roasted root vegetables, carrot puree, and a cherry jus lie and a roasted Wild Boar Porchetta with pistachio puree, hunter sauce and lemon-honey glazed carrots. Vegetarians and those who are ‘not game,’ will find an array of selections to their liking from the shareables and entrée menu including the new RDK Fried Cauliflower, soy milk fried served with a vegan three-pepper corn muffin and black bean patty in addition to several signature Red Dunn Kitchen items such as the Red Dunn Burger and Bangkok Brussels. Entrees range in price between $19 to $48. 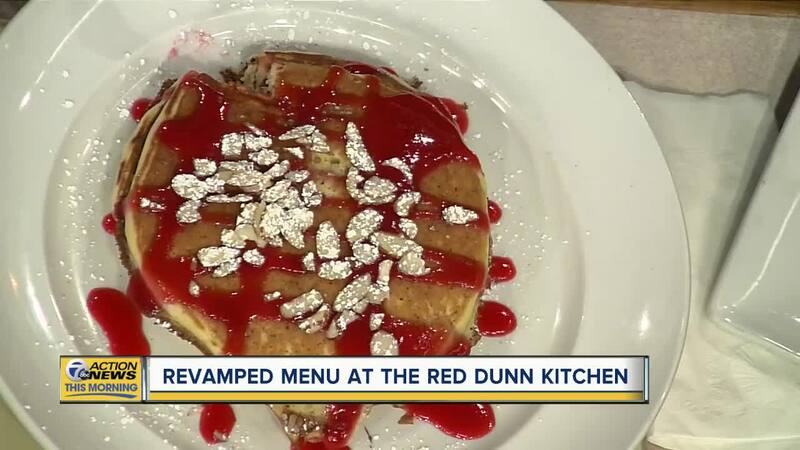 Red Dunn Kitchen is located at 1331 Trumbull St Suite 100, in Detroit. Hours are Sunday through Thursday 7:00 a.m. to 10:00 p.m. (bar is open until midnight), Friday and Saturday 7:00 a.m. to 11:00 p.m. (bar is open until 2:00 a.m.). For more information, visit https://reddunnkitchen.com/ or call 313-887-9477. Combine yolks, buttermilk, and almond extract. Combine all the dry ingredient and fold the wet into the dry. Whip the egg whites to soft peaks and fold into the batter.